update 2018-02-09: VLC 3.0 has just been released. Here’s a compatible version of the plugin (same source revision as before). update 2017-03-18: Link updated with fresh build (VLC 2.x). A few weeks ago I spent some time with the excellent sc68 software written by Benjamin Gérard (Ben/Overlanders). It’s a suite of software that can faithfully reproduce the workings of the YM2149 sound chip in the Atari ST and convert/play songs made for it. Additionally, which was the reason I took a look at it, Ben had made a VLC compatible plugin. Since the Mac sorely lacks a competent playlist capable Atari ST music player (XSC doesn’t do playlists, Audio Overload isn’t fully compatible) I was really interested to see if the *nix support in sc68 was enough for me to be able to compile a working plugin for OS X as well. I just tried it, and it works so well, many-many thanks for that! 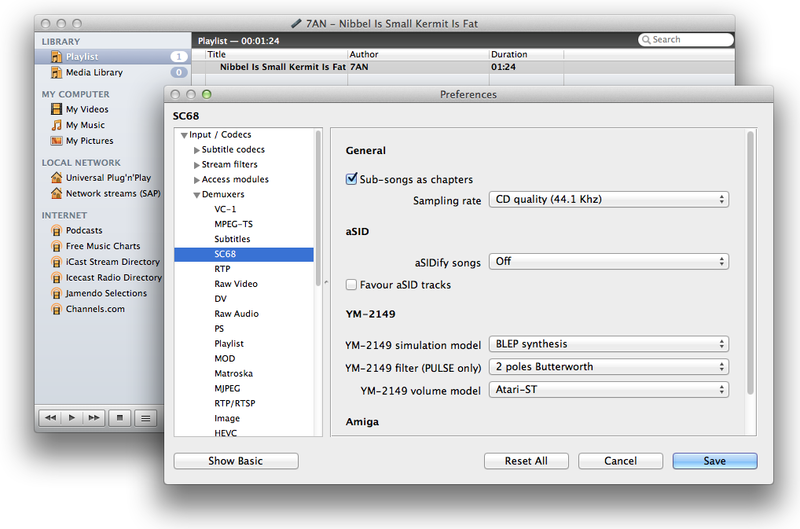 A little tip that may be helpful for others (and that I did find immediately – maybe not obvious): one can select the song to play in a given “multi-song” sc68 file. => Just select it in VLC > Playback > Chapter. Thanks again, you made my day ;-) ! Hi ! Hehe, I used to use sc68 13 years or so :-) By any chance, do you know if your plugin could be easily built for VLC over Linux too ? Cheers !